Prelude opus 114 by Ferdinand Carulli -	A great heart-bending piece to get started. Allegro opus 50 #3 by Mauro Giuliani -	A romantic song with beautiful arpeggios. Written by a famous Italian composer who's been called "the Beethoven of classical guitar". Study #1 from Dionisio Aguado -	A lively, fiery track filled with interesting chords and quick shifts with the left hand. Arpeggio study #2 by Dionisio Aguado - This famous spanish composer gives you another hot-blooded masterpiece featuring a melody in the bass with a spectacular arpeggio accompaniment. Tanz by J.C. Bach -	This is one of the easier classical pieces. Minuet by J.S. Bach -	A very familiar classic song, it is usually played by beginning pianists but sounds wonderful on the guitar. Signup to get classical guitar tips from Lily Afshar. 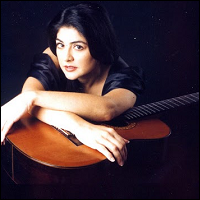 Lily Afshar is like a breath of fresh air in the world of classical guitar. Her concert appearances combined with her adventurous recordings have earned her the status of "one of the world's foremost classical guitarists" according to Public Radio International. Lily's collaborations with international composers have resulted in premieres of new works by Carlo Domeniconi, Reza Vali, Garry Eister, Gerard Drozd, Loris Chobanian, Arne Mellnas, Kamran Ince, Barbara Kolb, Marilyn Ziffrin, David Kechley, and Salvador Brotons. Recent highlights include concerts in the US, England, Ireland, Canada, France, Iran, Jordan, Denmark, Italy, Africa, New Zealand, Australia, and South America. At Florida State University, where she studied with Bruce Holzman, Lily became the first woman in the world to gain a Doctorate of Music in guitar performance. Lily was honored with the 2011 Distinguished Alumni Award from the Boston Conservatory, and the 2000 Orville H. Gibson Award for Best Female Classical Guitarist in Los Angeles. Her other awards include the Top Prize in the Guitar Foundation of America Competition and Grand Prize in the Aspen Music Festival Guitar Competition, among others. Get amazing guitar lessons at Guitar Control.